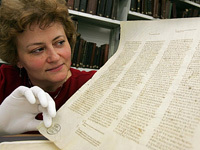 In Leipzig Unversity library, the exhibition, "Tischendorf in Search of the Oldest Bible in the world" opened. On February 18 in the library of Leipzig University, the exhibition, "Tischendorf in Search of the Oldest Bible in the world" opened. On exhibit are two pages from the "Sinai Codex." Also on display are documents related to the life and research of Friedrich Constantin von Tischendorf (1815–1874). The exhibition in Leipzig tells how Tischendorf was able to find the famous Codex in the monastery of St. Catherine on Mt. Sinai. Friedrich Constantin von Tischendorf was a famous German bible scholar. Even during his studies in Leipzig University, Tischendorf, the son of a Saxon physician from Lengenfeld, conceived the work of restoring the authentic text of the New Testament. According to Tischendorf's memoirs, in 1844 he discovered in a basket containing withered manuscripts on Mt. Sinai 129 large sheets of parchment with the text of the Septuagint—the Greek translation of the Old Testament. The monks gave Tischendorf 43 pages, which he brought to Leipzig in 1845. The scholar asked that the remaining 86 pages be preserved until his return. In 1853, Tischendorf again set off for the monastery of St. Catherine and tried to purchase the rest of the Codex from the monks, but was refused. A year later, he published his first find in Liepzig and then decided to make use of assistance from the Russian government—a patron of the St. Catherine Monastery. Tischendorf went to St. Petersburg, and then returned to the monastery, this time as a representative of the Russian Emperor. For eight days he searched out the missing parchments, but to no avail. The evening before his departure, Tischendorf was conversing with the monastery's abbot, who told him that he had an ancient manuscript in his cell. Thus was a nearly complete copy of the Sinai Codex discovered. The Codex was first given to Tischendorf for temporary use, but after his close acquaintance developed with Grand Prince Constantine Nicholaevich, whom the scholar accompanied in his trips to the East, the monks gave the manuscript as a gift to Russia. 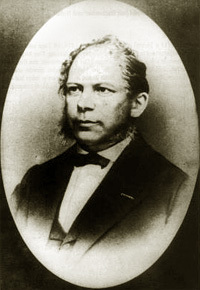 Tischendorf assumed the task of publishing the text. 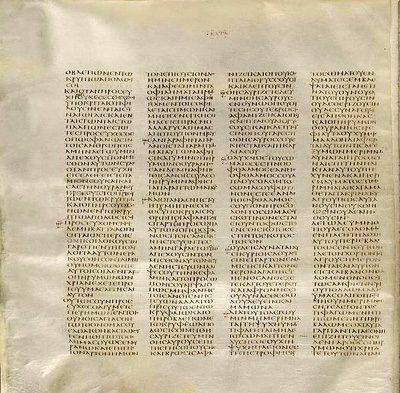 In 1862, the Sinai Codex was released in Leipzig with the title, "Codex Bibliorum Sinaiticus Petropolitanus, saved from oblivion under the patronage of His Imperial Majesty Alexander II, brought to Europe and published to the greater good and glory of Christian teaching, through the efforts of Constantin Tischendorf." A print run was brought to St. Petersburg for the celebration of the millennium of Russian statehood. This publication brought Tischendorf world renown, and in Russia he was granted status as a member of the nobility. In his later years, Tischendorf continued to work in the field of Bible textual criticism. In 1933, the Sinai Codex was sold by the soviet government to England, where it resides in the British Museum in London.